My wedding anniversary falls on July 4th weekend. My husband and I used to celebrate with a short trip, but not anymore. Not since our pet cam showed my dog, Tampa Bay, shivering and hiding in the closet with my other dog, Justice, standing guard in front of it, constantly barking because of the random fireworks being set off. In our home, dogs and fireworks don’t mix. Tampa Bay and Justice don’t show much enthusiasm for fireworks on the 4th of July. Photography by Melissa L. Kauffman. My dogs find the noise and the lights terrifying — and they’re not alone. Some dogs — not all — are noise sensitive. Their anxiety can be for short periods or long after the loud noise. Signs include panting, shaking, yawning, seeking comfort from you, hiding, peeing or pooping or even harming themselves. If your dog’s discomfort is minor, there are things you can do at home to help them. If your dog has a more severe reaction, speak to your veterinarian. No dog should have to live in terror on Memorial Day, the 4th of July … or any day when fireworks are present. An article by Stanley Coren, Ph.D., F.R.S.C. in Psychology Today, discusses the results of a 2015 noise-sensitivity study done in Oslo, Norway, by Linn Mari Storengen and Frode Lingaas from the Faculty of Veterinary Medicine and Biosciences in the Norwegian University of Life Sciences. The study found that a bit more than one out of every five dogs was reported to be fearful of noises (loud noises, heavy traffic, thunderstorms and, of course, fireworks). Interestingly, the study of 5,257 dogs (from 17 different breed clubs) found female dogs to be more fearful of noises than males, plus some dog breeds to be more fearful. Of the 17 breeds in the study, those that seemed most afraid were Soft Coated Wheaten Terriers, Shiba Inus and Norwegian Buhunds. The study also found that neutered dogs were more likely to be fearful when compared to intact dogs and older dogs were more likely to be fearful than younger dogs. The author concludes that this study suggests that noise-related anxiety behavior may be the result of physiology and heredity. 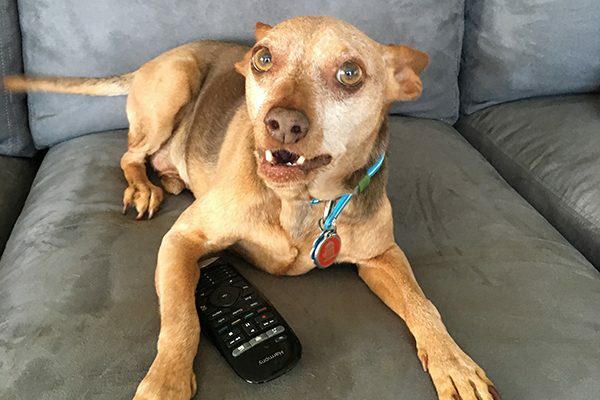 If your dog doesn’t mind noise from the TV, try turning up the volume or putting on a loud movie. Justice is ready to do just that! Photography by Melissa L. Kauffman. 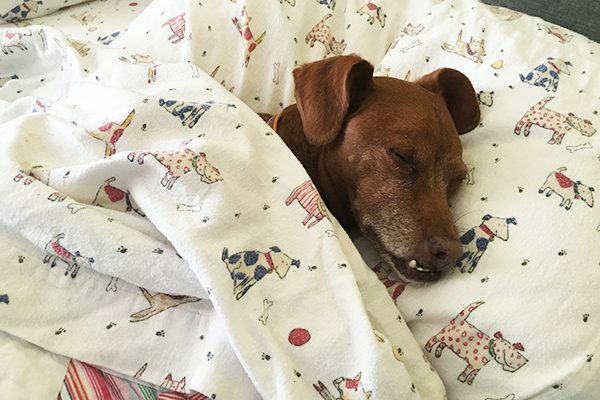 Some dogs find comfort in being wrapped up or swaddled, like in a Thundershirt or laying in your bed under the covers like Tampa Bay here. Photography by Melissa L. Kauffman. Fireworks for the 4th of July. Photography by Melissa L. Kauffman. Try putting your dog in the bathroom with the fan and water running. 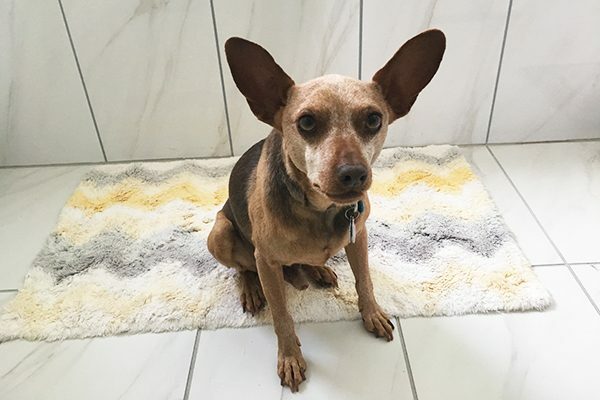 Justice likes the bathroom as long as there are comfy rugs, water and treats. Photography by Melissa L. Kauffman. Don’t punish your dog for any fear-related behavior. Also, don’t reinforce the fear by being overly comforting. Dogs can learn to be afraid of fireworks from other dogs or people who are afraid, so keep calm and don’t react to the fireworks. If your dog has an extreme fear response (pooping, peeing, vomiting or harming himself), see a veterinarian immediately for help. 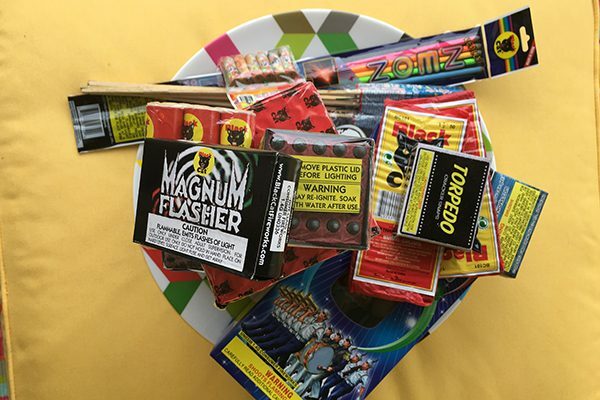 Safest bet — don’t take your dog outside when there are fireworks at play. If you do, put him on a leash attached to a harness he cannot get out of. Never tether your dog — it puts him in a position where he can’t get away from another person or dog, plus you aren’t actively watching him. Prepare for the unthinkable — an escaped dog. Update his collar and ID, get him micro-chipped if he isn’t and, if he is, update the information. Also update all of his shots in case he bites some helpful stranger out of fear. Tell us: How do you deal with dogs and fireworks? Tell us your tips and tricks! Melissa Kauffman is the executive editor of Catster and Dogster. She and her two fireworks-hating dogs live with her husband and two fireworks-don’t-bother-me parrots in North Carolina. This article was originally published June 30, 2017. 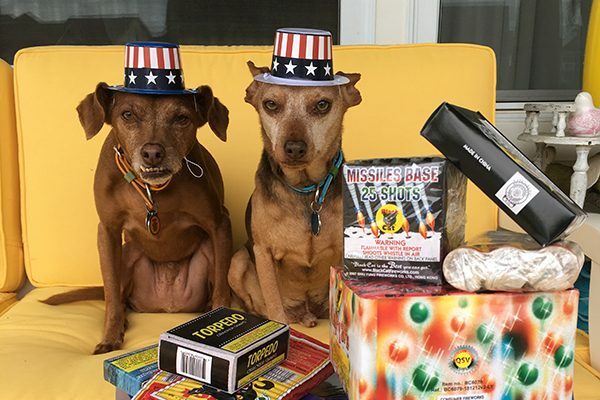 The post Dogs and Fireworks — Stop Your Dog from Being Scared appeared first on Dogster.